I can already hear the questions coming. Do natural deodorant for men actually works? Maybe if you had asked a few years ago the answer would have been different, but these days the answer is a definite YES. Not only are there some effective natural deodorants, but there is an embarrassment of riches too. 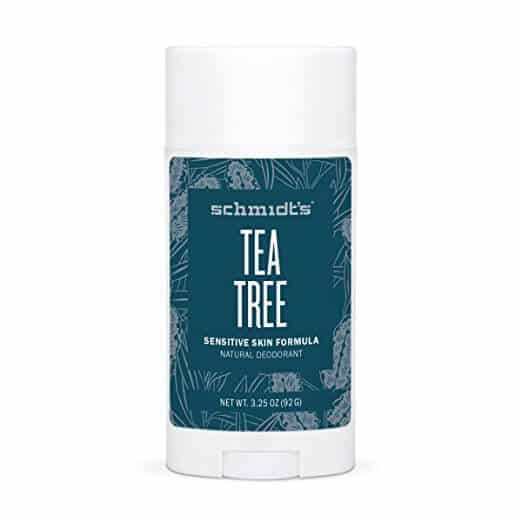 There are a lot of top rated natural deodorant for men that get the job done and there is a pretty wide variety to choose from, as well. If you find yourself on the fence wondering if it is worth it to use a natural deodorant, let me tell you, you should definitely give it a shot. 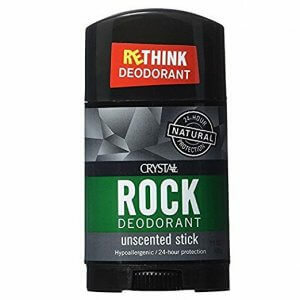 There are even strong natural deodorants for overly sweaty guys to choose from. Remember, it’s not sweat that makes you smell, but the bacteria under your arms that eats the sweat that causes the smell. A natural deodorant can kill or neutralize that bacteria and you won’t smell. Just below I made a table comparing the best natural deodorant for men in case you don’t have time to read all the reviews. If you want more detailed information about the deodorants then keep scrolling down to learn more. 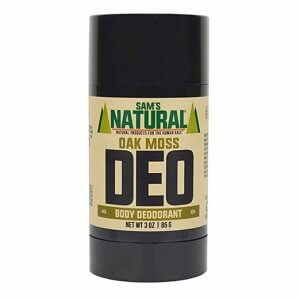 Great all around natural deodorant for men that feels like a conventional deodorant but works much better. Heavy sweaters that need a heavy duty natural deodorant that lasts all day. People that want as few ingredients as possible. This has only one. People looking for a totally organic, vegan and animal cruelty free natural deodorant. When you work out and need a high strength natural deodorant that lasts all day. When you are looking for the best unscented deodorant that heals your armpits and recalibrates your bacteria. If you have sensitive skin that gets irritated by baking soda, this one is baking soda free. Aluminum is getting some bad press these days as having some links to diseases like Alzheimer’s. There is still no smoking gun about how true that is, but studies seem to be pretty persuasive making the case. Since there are plenty of deodorants that don’t have aluminum, then it is best to avoid the ones that do. Though it is usually antiperspirants that have that ingredient and not regular deodorants, but more on that later. Many companies that make natural deodorant for men are generally very conscious of sensitive issues like testing on animals. All of the deodorants reviewed in this article are animal cruelty free as many people are making choices based on issues like this that they believe in. Since there is a choice, it makes sense to forego the old guard and start making choices that benefit our furry friends, too. The skin under your arms is very sensitive and readily absorbs the ingredients from your deodorant. If you have a lot of unknown ingredients in there, then who know what you are putting into your body. Then there are the toxins we do know about like phthalates and sulfates that really have no place on our skin or in our bodies. Before you go and order any of the products I recommend here I need to make sure you know what you are ordering. There is a big difference between deodorant and antiperspirant. The one thing they have in common is that they keep you from smelling, but how they do it is very different. Deodorant keeps you from smelling by either masking the smell of your sweat, or by neutralizing the bacteria that causes the sweat. But, you will sweat just as much as you normally would in most cases, when you use a deodorant. Antiperspirant actually blocks you from sweating to begin with and then has ingredients to keep bacteria from causing your BO. The main ingredient in antiperspirant to block your pores and prevent sweating is aluminum. So, when talking about the differences here, there are no deodorants with aluminum, anyway. There is a mineral salt that is an aluminum compound found in some natural deodorants, but it is not the same chemical as the aluminum that has been linked to health issues. So far, this aluminum compound is the only recognized ingredient that is an actual antiperspirant. Some natural ingredients can help reduce sweat, like talc and baking soda, but they are not as effective as aluminum. If you are worried about sweating when using a natural deodorant for men as opposed to an antiperspirant, you shouldn’t. You may sweat a lot at first when you make the switch. After a few days to a week your body will regulate itself. Instead of using a product to artificially stop a natural process, letting your body decide when and how much to sweat is the best way to stop sweating as much, naturally. If you’re making the switch from antiperspirant to natural deodorant for men then you may actually smell in the first few days as your body adjusts. 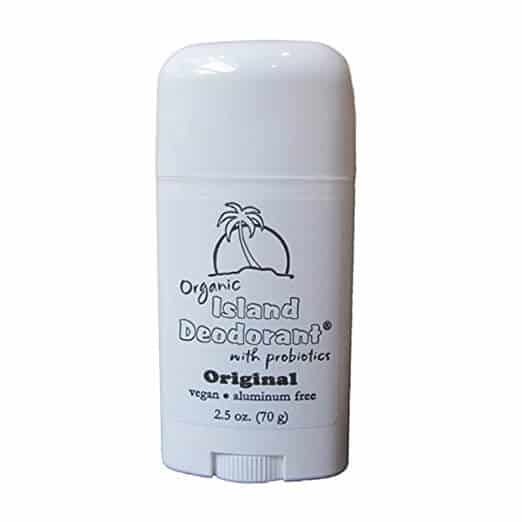 I’m calling this the best aluminum free natural deodorant for men, but, really it is the best all around one. It is vegan, cruelty free, aluminum free, parabens, phthalates and propylene-glycol free. All the bad stuff, in other words. What I love best about it, though, is that it is a chemical free or natural deodorant for men that also smells awesome. 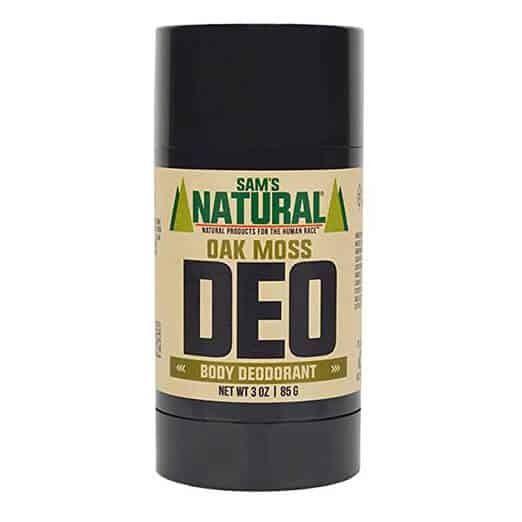 In my opinion this is the best smelling natural deodorant for men since it has such an unexpected old school fragrance. There are other scents available, but this one smells the most manly and masculine. With predominantly oakmoss, it has a classic, vintage scent. It has a very earthy and warm scent that also smells very fresh. The ingredients go beyond just helping you smell great, though. It contains baking soda and arrowroot powder, so it will reduce the amount you sweat to some degree if you sweat a lot. In addition, the baking soda neutralizes the bacteria on your skin. Coconut oil will take care of whatever bacteria the baking soda didn’t get, while also moisturizing the skin. Compare this to your conventional deodorant and you will never know that this is all natural. It is very effective at odor control and also lasts a long time. Add the great scent and you have a winning combination. A little goes a long way, so the stick will also last quite a while before you run out. If you feel a bit of a rash after using it, give it a few more days. It may be the baking soda and your skin’s reaction to it. If the rash persists or gets uncomfortable, then that means you should avoid baking soda based deodorants. If you like your scents on the sweeter side and love the fresh scent of citrus, then you will love this natural deodorant by Rocky Mountain Barber. Don’t worry, it does smell manly and not overly sweet. It is more refreshing than it sounds. It goes without saying that this natural deodorant for men is aluminum free and is a non toxic men’s deodorant, but it is also fragrance free. By fragrance free, it means it doesn’t use a synthetic for a scent. The scent comes from natural essential oils to give the fragrance instead of chemicals. It uses a blend of arrowroot powder and baking soda to keep sweating to a minimum. Shea butter and coconut oil help keep the armpit skin healthy and hydrated. If you need something that lasts a long time and is very strong, then this is a great deodorant. 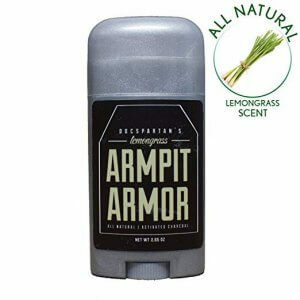 The blend of ingredients makes this a good deodorant for guys that need some extra strength. It doesn’t get anymore natural, and free from everything as this one ingredient deodorant. Yes, this salt crystal rock deodorant has only potassium alum in it. That’s it. It has no scent, no toxins, no nothing. So, how does a crystal deodorant work? First you have to wet the rock or at least use it right out of the shower when your armpits are wet. Since it is literally a block of mineral salt, it won’t go on if it isn’t wet first. Then what happens is that the mineral creates a layer in which bacteria cannot grow. They can’t eat the sweat you excrete so they die. You still sweat, but it doesn’t stink. Best part is it lasts for more than a day. You can put it on in the morning and not need to reapply again no matter how sweaty you get. It won’t stain clothes, even if you are a heavy sweater. It saves money since a stick can last for months potentially. It isn’t sticky like some deodorants. It also washes off very easily. It is very easy on your body. Your pores will not get clogged and your skin doesn’t react it to it. There is no chance of rash so it is probably the healthiest deodorant you can buy. If you have problems with baking soda based deodorants then this is a logical choice. 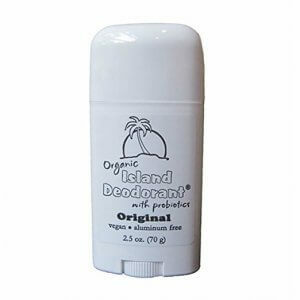 This is not only an all natural deodorant, but it is also USDA certified Organic and vegan and animal cruelty free. It has no scent aside from the faint smell of the essential oils in it like coconut oil, but aside from that is unscented and fragrance free. Having a deodorant that is totally organic and vegan is great, but what really sets this apart from other natural deodorants is that it is actually a healthy deodorant. It will leave your skin healthier than if you didn’t use anything at all. It is so natural that you can eat it. Well, I suppose any deodorant is edible once, anyway. You can eat this one and not get sick! Not that I condone eating deodorant. My point is that it is non toxic to the nth degree. You won’t smell because of the natural antibacterial ingredients and it is very soothing on the skin. Particularly from the coconut oil. In fact, it is specially formulated for sensitive skin. The only potential problem is that it does contain baking soda. If you know your skin can’t tolerate baking soda then give this one a pass. If you find yourself with some skin irritation due to the baking soda, give it some time to see if your skin adapts to it. If it does then you will be rewarded with an excellent vegan alternative to conventional deodorant. When you workout, you need something to neutralize odors and not just mask them. Since you can keep sweating after the gym for some time, you have to have some heavy duty natural deodorant for men and some, honestly won’t cut it. 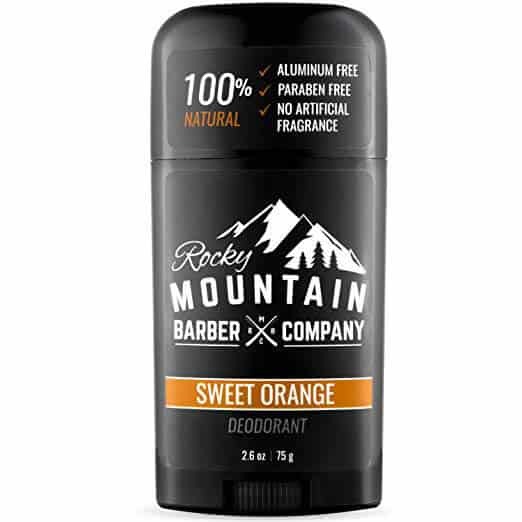 This chemical free, aluminum free deodorant is ideal for the guy that loves to work out but needs a non toxic formula to really do right by his body. It neutralizes bacteria with activated charcoal cutting down on the odor causing germs. Baking soda minimizes the sweat to keep you drier than you would expect after a workout. The scent is very light and refreshing of lemongrass. Something definitely different when it comes to deodorant fragrances. Again, this is not heavily scented to mask your odor like conventional deodorants. This neutralizes it so the lemongrass aroma is just right. Shea butter and beeswax will actually leave your armpits much healthier. In fact, if you have dark skin under your arms, then this will help to get rid of those spots. You may have seen Dr. Spartan on Shark Tank. Not that that alone is an endorsement of the product, but it does work. The texture goes on like the gel style deodorants, though not sticky. Using conventional deodorants or antiperspirants can throw your natural ecosystem of the armpits out of whack. You kill a lot of bacteria, but some survive and start other strains. If you have ever found that your deodorant or antiperspirant stops working, this is the reason why. It’s helpful to have a probiotic deodorant that actually adds some beneficial bacteria to your pits. There is no scent at all. Not even a faint smell of essential oils you get in other natural deodorants. You will also stay stink free for a while as this is long lasting. A little goes a long way so the deodorant will last a long time, too. There are very few ingredients so it is a good choice for people that can’t do certain essential oils or other natural remedies. If you are a person that runs hot or you live in a humid area, it has candelilla wax to make sure the deodorant stays put. 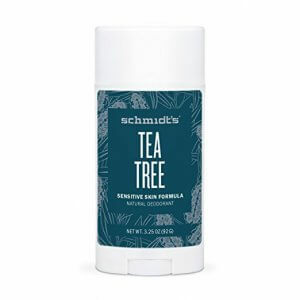 If you have been on the hunt for a high quality natural deodorant you have no doubt read the reviews on Schmidt’s Natural Deodorants. They are the best rated natural deodorant for men for good reason. If you have sensitive skin then you will love the fact that there is no baking soda in this. Instead, it uses tea tree oil to neutralize the bacteria and creates an antiseptic environment which prevents them from coming back. The tea tree oil is also good for circulation so you get an added bonus of healthier skin under your arms. Also due to the fact that it contains Shea butter and jojoba oil. Again, we find some candelilla wax to keep the deodorant from melting and running off of your skin before it has a chance to properly get absorbed. To keep moisture to a minimum it includes arrowroot powder. You may find some tingling sensation from the tea tree, but that is natural. It doesn’t mean it is going to irritate your skin. It’s almost like a eucalyptus feeling. It goes on much easier than the other cream paste ones that are very popular from Schmidt’s with considerably less mess. It goes on just as any conventional deodorant would. It does go on like a paste, but you don’t need to use your hands or scoop it out of a jar. 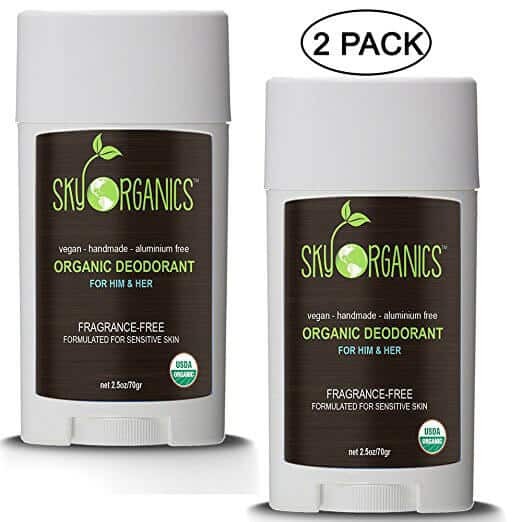 Everyone of the deodorants I reviewed here in our best of guide to natural and organic deodorants is aluminum free and synthetic fragrance free. They are totally safe natural deodorants to use. 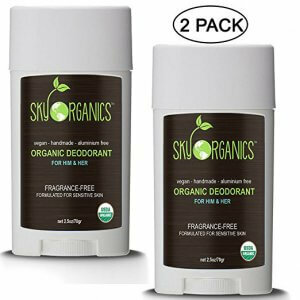 There are a few “natural” deodorants that I left off of this list even though they are very popular. Arm and Hammer for one, since many of the ingredients are chemicals, but since things are very loose with regulations on what can be called natural, they still fall under the banner of natural. Don’t just take the brand’s word for it that it is natural. Review the ingredient list carefully. Another is Herban Cowboy for the same reason. There are just too many not really natural ingredients for me to want to review it. The only thing to really keep in mind with many of these deodorants I reviewed is that there could be some baking soda side effects that you didn’t expect. If this is your first time using a natural deodorant for men, then you might not know that your skin is sensitive to this. Even if you don’t have sensitive skin, you might find it irritating. Don’t let that stop you, though. Maybe not every one of these deodorants will work great for everybody, but everybody can find one that works for them from this list.